How does the 2019 Ram Heavy Duty pickup deliver more torque than its rivals? 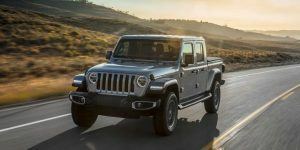 The introduction of this all-new family of trucks was headline news at the recent Detroit Auto Show. When properly equipped, they offer customers 1,000 pound-feet of tire-shredding twist, peaking at just 1,800 rpm on the tachometer. That’s a nice increase compared to what rival models from Ford and GM can provide right now. For reference, Dearborn’s latest and greatest Power Stroke V8 diesel is rated at 450 horsepower and 935 pound-feet. The compression-ignition Duramax V8 in GM’s 2018 model-year heavy-duty pickups delivers 445 horses and 910 torques. Ram is the first to stray into four-digit territory. That mountain of twist is provided by the optional Cummins inline-six diesel, a legendary powerplant offered, once more, in two potencies. Displacing a husky 6.7-liters, in standard form it delivers 370 horsepower and 850 pound-feet of torque, but in high-output guise, it’s rated 400 and 1,000, respectively. 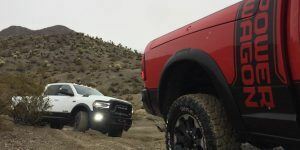 This gives Ram a welcome edge in overall twist, though it still trails rivals in horsepower, which, admittedly, isn’t as important when towing and hauling. “Torque moves the load, right?” said Romain, something that allows a properly equipped Ram Heavy Duty model to tow up to 35,100 pounds. Delivering that capability, engineers took a systems approach to redesigning these new Ram pickups. “You just don’t put 1,000 pound-feet in a truck without changing other things to go with it,” explained Romain. 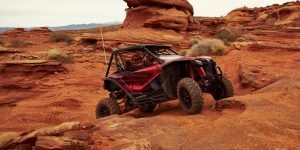 He said the transmission, transfer case, driveshaft, axle, frame, radiator, induction system, and exhaust have all been enhanced to enable that four-digit torque figure. Even the front-end of these trucks was changed to accommodate that output. “That’s why the grille is bigger. That was to basically go around the radiator that was needed to cool 1,000 pound-feet,” said Romain. One of the most important enablers of that torque figure is a redesigned cylinder block. While the bore and stroke remain the same as in last year’s Cummins, for 2019 it’s now cast of compacted graphite iron, an advanced material that’s much more durable than conventional iron. This metal is also better at attenuating noise and vibration, plus it allows for thinner, lighter castings with no reduction in strength. The venerable Cummins diesel’s cylinder head has been redesigned, sporting new exhaust valves and upgraded rocker arms. This engine’s oil and water pumps have also been redesigned, plus it’s been fitted with a brand-new fuel-delivery system, one that operates at 29,000 psi (2,000 bar) for enhanced performance and efficiency. Filling its six holes are new, lower-friction pistons and upgraded forged connecting rods riding on reworked bearings. On the exhaust side, there’s a brand-new manifold supporting a variable-geometry blower, though Romain said, “It’s actually the same turbo between the standard output and the high output, but the calibrations are different between the two applications.” It provides up to 33 pounds of boost. Curiously, the compression ratios are different between these two flavors of Cummins engine. The standard variant squeezes air at a ratio of 19-to-1, the higher-output one only 16.2-to-1. Again, differences in calibration allow it to crank out more horsepower and torque. 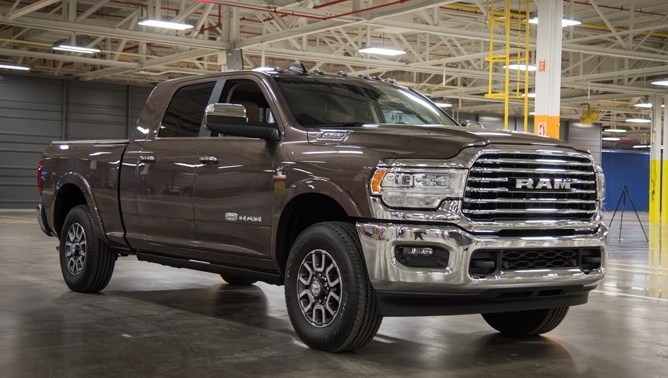 But don’t think engineers skimped or cut corners with the 2019 Ram Heavy Duty’s “base” diesel engine. “All of the benefits and all of the upgrades that are in a 1,000 pound-feet motor, those are in the 850 [as well],” explained Romain. This includes the fancy new block, enhanced cooling system, improved crankshaft and more. The redesigned range of Ram Heavy Duty trucks is set to launch in the second quarter of the year. When asked what his favorite attribute is of these new pickups Romain said it’s the comfort and confidence. “You can drive this truck up through mountain passes and you’re at ease. Between the trans calibration and the torque that the engine provides and the sound-quality improvements through acoustic glass and noise-cancelation, it’s just a fantastic ride,” and one we look forward to experiencing first hand in the coming months.